The New York Aquarium is the oldest continually operating aquarium in the United States, having opened in Castle Garden in Battery Park, Manhattan in 1896. Since 1957, it has been located on the boardwalk in Coney Island, Brooklyn. The Aquarium is managed by the Wildlife Conservation Society (WCS). Originally owned by the City of New York, the New York Aquarium opened on December 10, 1896, at Castle Garden in Battery Park. On October 31, 1902, the City transferred control and operation of the Aquarium to WCS (then known as the New York Zoological Society). At that time, the Aquarium housed only 150 specimens of wildlife. During the tenure of its most famous director, the distinguished zoologist Charles Haskins Townsend, the collections grew considerably, and the Aquarium attracted hundreds of thousands of visitors each year. In October 1941, the Aquarium at Battery Park was closed by NYC Parks Commissioner Robert Moses in preparation for the Brooklyn-Battery Tunnel. Many of the Aquarium’s inhabitants were temporarily housed at the Bronx Zoo's Lion House until the new aquarium was built after World War II. 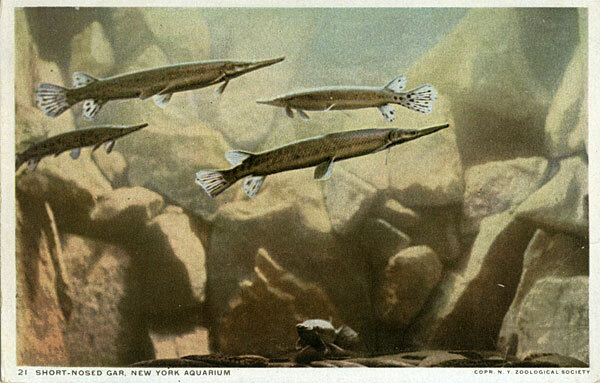 On June 6, 1957, the New York Aquarium opened at its new location in Coney Island, Brooklyn. The Aquarium has a long history as a beloved New York City attraction, and the 75 postcards on display here show off the sights that have dazzled its viewers over the years.